The beagles on the left are testing cigarettes. It know it's a tough image to see I know, but it needs to be seen. Every day researchers use thousands of beagles to test cigarettes, household cleaners, chemicals, pharmaceuticals and sometimes cosmetics. Beagles are the number one breed used in labs. They're sweet and trusting dogs, as we all know. But that sweetness is a curse. What's worse is what happens after. After years of experimentation, years in a cage without a kind word or touch, without love or affection, without decent food or a bed, these animals are killed. That's it. They are bred, live and die for research. Beagle Freedom Project is trying to change that. The Beagle Freedom Bill is currently working its away through the California and Minnesota legislatures. What it does is compel publicly-funded facilities to release dogs and cats used in testing into the care of rescue groups. Beagle Freedom Project is the group behind the bill. They've rescued 150 beagles since 2010. They've also saved other dogs used in research, as well as cats, rabbits, pigs and ponies. The problem is, many facilities are unwilling to release the animals. They are afraid they will be publicly criticized for using animals. Right now the bill is in the California and Minnesota legislatures. Beagle Freedom Project has an action page where you can contact legislators, sign petitions and download materials to help spread awareness. The bill is also expected to be introduced in the New York legislature this session. "While we are busy supporting campaigns in all these places for the bill’s passage we are also looking towards the future and investigating other opportunities to introduce," said Kevin Chase, director of operations with the Beagle Freedom Project. "That being said, we are a small organization with a limited staff and budget, and from that budget we can only spend 15 percent on political activities. With the three states we are in at present we are pretty much at our capacity for this session." But next year, if you are interested in getting the bill passed in your state, BFP might be willing to work with you to make that happen. You'll need to have sponsors in the legislature -- that means talking to your local lawmakers. If you're interested, contact BFP at: info@beaglefreedomproject.org. 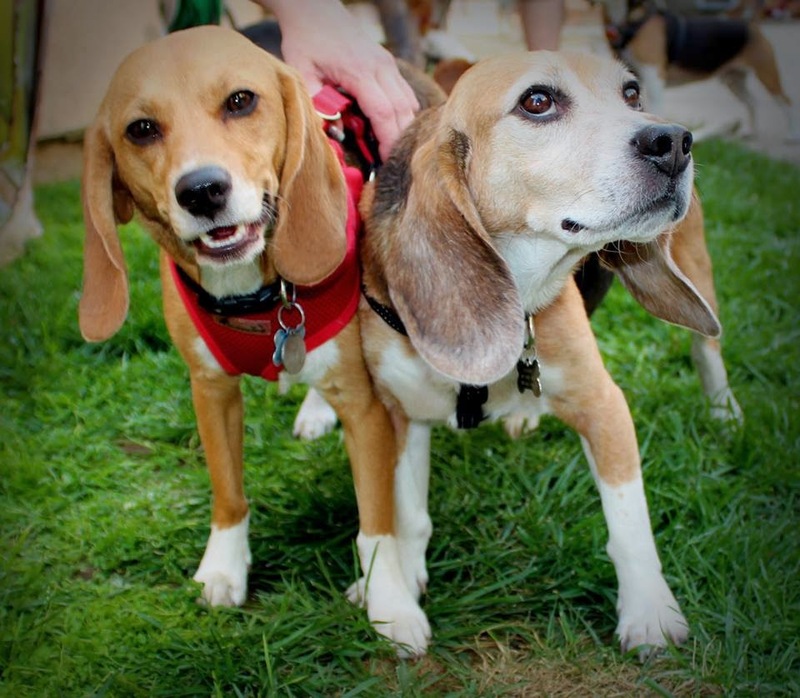 Bogart and Indie, rescued beagles. In the U.S. House, Rep. Jim Moran (D-Virginia) is trying to end cosmetics testing in America -- H.R. 4148. The bill would end testing on animals and also phase out the sale of cosmetics that are tested on animals in foreign countries. Moran points to LUSH cosmetics as an example of a successful company that markets beauty products that are not tested on animals. The bill has 22 co-sponsors but it's only been referred to one committee. A bill like this will require more bipartisan support. It also needs a companion bill in the U.S. Senate. How can you help? Find your representative on the U.S. House site and tell them that you want the bill to move forward. What do you look for when you buy a home? Right number of bedrooms? Open kitchen? Nice appliances? Good neighborhood? Good place to put a litter box? Fenced-in backyard? Flooring vs. carpets? Good place to put in a dog wash? Yes, I'm buying a house. That's why I've been relatively quiet here the last month or so. 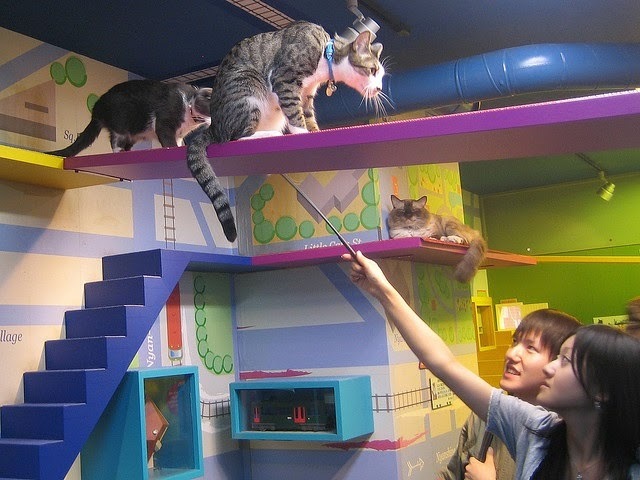 Or this cat room. One house I looked at had custom shelves up high in the living room. Wouldn't they be perfect for something like this? Though who am I kidding? Lulu will just sleep on the bed as always. Here are a few more great ideas from Better Homes and Gardens. 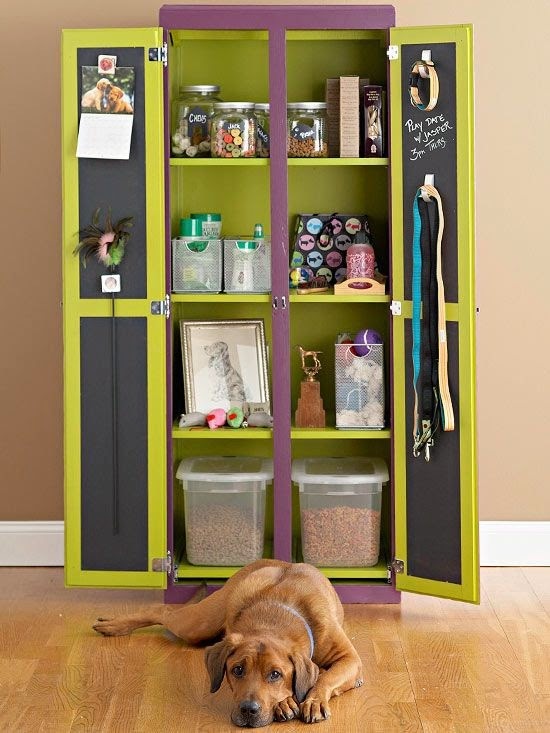 They include what type of paint to use, easy pet food storage and how to secure windows. Meanwhile, check out this list of important things to consider when buying a house from Realtor.com. Got any favorite pet-decor ideas for your home? Share them below! Have you entered our Hill's Science Diet Metabolic Starter Kit? We are giving away 10 kits for cats or dogs, with your veterinarian's approval, to help your pet lose weight. Get all the details in my #HillsPet post here! Lulu and I get a lot of comments about her figure. It's something I'm pretty proud of. I constantly worry about her weight. A beagle in good shape should have a bit of a slope from the chest up to her tail area. You should be able to JUST make out the ribs when you pet her. You should also have a decent body line when they lay down -- the body should not be so noticeably thicker than the head. Photo courtesy of Dale via Flickr Creative Commons. Beagles, however, have a tendency to get heavy. They don't really have a mechanism that tells them they are no longer hungry. Left to their own devices, a beagle will eat until they burst. Couple that with a craftiness and big begging eyes that melt the heart of most humans, and beagles and food can be a dangerous combination. 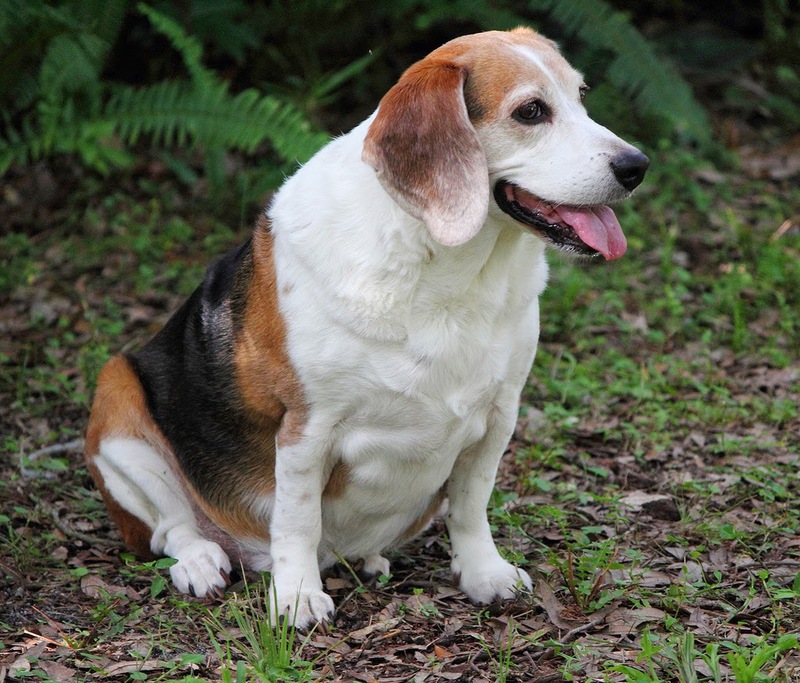 Looking for help in slimming your beagle down? Keep reading for a chance to win a Hill's Pet Weight Loss and Management Starter Pack. Weight issues are a big problem for both dogs and cats in the United States. According to the Association for Pet Obesity Prevention, in 2012 53 percent of dogs and 55 percent of cats could be classified as overweight at the very least. Plus... your pet may be fat and you don't even realize it! About 22 percent of dog owners and 15 percent of cat owners think their pet is fine, when they aren't. So do you have an overweight dog? What about an overweight cat? Hill's pet food has come out with a new line -- Hill's Metabolic Advanced Weight Solution. This is a special veterinarian-prescribed food to promote weight loss for cats or dogs. Hill's Metabolic is a complete product line, with dry and canned food plus treats. The food is designed to turn up the metabolism and help give cats and dogs more energy. The pets are supposed to feel full and satisfied, but still lose weight. In a study of 314 pet parents who fed their cats and dogs the food at home, 88 percent lost weight in two months. That's not bad. So if you are looking for a good diet for dogs, here's your chance to try Hill's Metabolic Advanced Weight Solution for free! 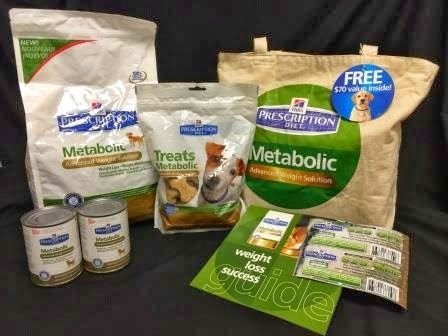 Hill's is letting us give away 10 Hill's® Prescription Diet® Metabolic Advanced Weight Solution trial kits for dogs or cats. First and foremost -- we must make this clear -- you must, must, MUST get your veterinarian's approval to get this kit. You will have to prove you have their approval. This is a $70 value! Dog food product details can be found here. Cat food product details can be found here. Your pet's name -- a dog or a cat? We'll be using a randomizer this time, instead of Rafflecopter, so you MUST include all the information in order to be included. You have until April 5 to enter. Before starting a weight loss program a doctor should be consulted. Your veterinarian’s authorization is required before starting Hill's® Prescription Diet® Metabolic Advanced Weight Solution food. This giveaway is limited to one winner per household and is for U.S. residents only. Be sure to use a valid email when leaving your comment so we can contact if you are chosen as a winner. This was going to be a simple review of Global Pet Expo. Pictures of our favorite products, lots of puppies (because PUPPIES!!!!!!!!!!). You know, typical blog schlock. Lulu poses in front of an overhead view of Global Pet Expo 2014. "The takeaway from the Global Pet Expo, at which 985 exhibitors of pet products were spread out over 13 football fields’ worth of real estate in the Orange County Convention Center here, is that Americans really love their dogs. And yet, perhaps as a result of so much love, those dogs are increasingly anxious, bored, overweight, messy and have terrible breath. They suffer from separation anxiety and they worry about thunderstorms, traffic noises, visitors and vacuum cleaners. Their joints ache, and they eat too fast; they chew the furniture and bedevil the neighbors with their barking. Also, drool happens." This comes from the New York Times article "Every Dog Has Its Daybed." It's a review of the Expo, but in my opinion it was a review that looked down its nose at pet owners -- and particularly dog lovers -- who are apparently killing our dogs with luxurious kindness. Lulu takes a break at the Enchanted Home Pet booth. What made it worse were the comments. "How dare we buy natural food and orthopedic beds for our dogs when there are starving kids? Why are we making slow-feed dog bowls when there's climate change? What about all those pets in the shelters?" You know, I admit it! Some people take this whole pet love thing a bit too far. People overdo it. Americans alone will spend well over $50 billion on pets this year. But the majority of that, according to the American Pet Products Association, is food and veterinary care. Why food? Because people want to eat healthy, and they want to make sure their pets do too. We've had recall after recall, we've had dogs die from companies cutting corners. So people want to make sure their pet doesn't die horribly, and we're willing to pay more for that. So sue us. Why veterinary care? Because pets are living longer and more people are making sure they're cared for. And more people are willing to try to fight illnesses like cancer and diabetes instead of grabbing the shotgun and taking the dog out by the wood shed. We're also getting more of our pets fixed so they don't have babies that end up in shelters. $13.14 billion is what is being spent on over-the-counter meds and pet supplies. That's flea meds, toys, leashes, collars, and yes, orthopedic dog beds, sweaters, and anxiety coats (because lightning and fireworks are scary for dogs and no money spent on training or a behaviorist is necessarily going to help your dog overcome that!). Sealy dog beds start at $99. Here's what I also know. I brought Lulu to Global Pet Expo two of the three days. I brought her because I actually feel more comfortable talking to some of these pet people when she's there. She's a great ice breaker. But people love her being there as much as I do. People come running up to pet her because they miss their dogs. They share their stories of their pets -- not only their current ones, but the dogs they had as a child. We bond over our pets. Lulu gets spoiled. OH BOY does she get spoiled. She gets pets and treats and pets and treats and -- did I mention treats? I have to stop people from giving her treats because I don't want her to get sick. These are people who love pets. But that's not all they love. Many love people. Families came to display products they were proud of. One teen even developed a product (ICPooch) herself, and her family was at Global to support her. This is because pets can draw families closer together. Then there are those of us who don't have children. We have our pets. Our pets give us comfort when we don't have a person to do so. And the notion that for every pet in a designer dress and a posh bed feasting on kibble there's a child in threadbare clothes going to school hungry is ludicrous. I won't pretend that there are people in this world who have their priorities screwed up, but so far I have yet to meet a human that puts their pet before their child. Lulu checks out the treat display at the Merrick booth. Just because I keep Lulu in fancy doggy treats doesn't mean I don't also donate to causes that help humans. I do. Why wouldn't we be able to do both? And the group behind Global Pet Expo runs a whole charity that examines the human-animal bond and finds ways to strengthen it. Both humans and pets should have great lives and HABRI promotes that. Then there were all the pet charities that benefitted because Global Pet Expo came to town. Florida Little Dog Rescue brought pets to be adopted. So did SPCA of Central Florida. Many groups got donations of food and pet supplies. Rocco, the pup in the front, was up for adoption at Global Pet Expo. Note that those last few points did not make it into the New York Times article. So before you condemn people who will be buying some of these fancy products from big and little pet stores, Amazon and Etsy websites over the next year or so, just remember -- we aren't all Leona Helmsleys living our dogs millions. We are just regular folks who love our pets because they bring us closer to each other. Elvis and the Hound Dog have left the building. Global Pet Expo is next week! Lulu at Global Pet Expo last year. For those who don't know, Global Pet Expo is like Fashion Week or Consumer Electronics Show for the pet world. People from all over the world will be in Orlando, looking at products both new and classic, everything from dog bowls to fish tanks to cat condos. Last year, the expo was three football fields long. By the end of the day, this was Lulu. The expo is, sadly, not open to the public. So all next week I will be showing some of the neat things I find at the expo. Make sure you are watching the blog, or that you follow me on Twitter @lifewithbeagle, or on my Facebook page. I may also try to do some Vine or Instagram stuff, so stay tuned! If you're in town for Global, or if you plan on visiting Orlando with your pet soon, please check out some of these great pet-friendly spots. We are a great community for pets. 1) Woof Gang Bakery -- Though the first store opened in South Florida, the company is actually based in Orlando. Woof Gang is a boutique offering high-quality pet food, pet gear, fresh baked cookies and sometimes more -- grooming, day care, even a medical clinic. The stores are each individually owned. There are two not far from the tourist zone, but we have them all over Orlando. And they are not the only pet bakeries in Orlando. Also check out Bark Avenue Bakery on Sand Lake Road or Pookie's on Fairbanks Avenue in Winter Park, to name a few. 2) Orlando's dog parks -- Like a place where dogs can run and play? Orange County, Florida is home to eight dog parks run by the county, plus Fleet Peeples Park in Winter Park. My personal favorites are Dr. Phillips Park, near Disney, and Barber Park, which is near Orlando International Airport. Dr. Phillips Park is small, but the other dog owners are friendly. I rarely see problems at the park. It;s also well kept. Barber Park is slightly bigger, and it has agility equipment for dogs to tryout. Both have separate areas for small and large dogs, doggy water fountains, and places for humans. 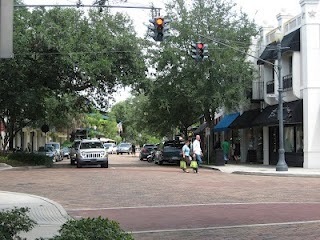 3) Park Avenue, Winter Park -- The city of Winter Park is not too far from Orlando, and Park Avenue is the downtown area. While dogs are not allowed in Central Park, they are welcome to walk around the street on a leash, drink from outdoor water bowls, sit with their owners in outdoor cafes and even enter the stores. As long as your dog is well-behaved, they are welcome. There is also The Doggie Door, a shop for pets and their dog lovers, with treats, toys, clothes and pet lover items like clothes, games and household items. Dogs are welcome at some of the festivals, farmers markets and parades throughout the year. There are two big dog events on Park Avenue as well -- the Doggy Art Show, and the Halloween Costume Parade. 4) Dog-friendly dining -- While we are talking outside cafes, Orlando was actually the pilot city for dog-friendly dining in Florida. We have lots of restaurants who welcome dogs on their patios. It's good to ask ahead of time though, because not every patio allows dogs (which to me is silly, but what can you do?). 5) Quantum Leap Winery -- You won't find a vineyard growing Pinot Noir or Chardonnay in Florida. The grapes just can't survive here. However, we do have wineries that bring the grapes to Florida and make their own wine. Quantum Leap does this with an eye towards being as environmentally friendly as possible. Dogs are also welcome in the main wintery show room. You dog may meet owner Jill Ramsier's dog Kaley. And you can try some of her own wine -- Kaley's Rescue Red. Proceeds from the wine's go to benefit SPCA of Central Florida. Quantum Leap Winery is in Orlando in the Mills 50 area. 6) Mall at Millenia -- This high-end mall may not like me broadcasting this, but you can bring your dog there. Dogs are permitted at the mall in Orlando, provided they remain in a carrier or a stroller. Of course, service dogs are welcome everywhere. So Lulu will not be going to Mall at Millenia any time soon. However, it makes sense to me that frou-frou dogs are welcome at the frou-frouiest mall in Orlando. 7) Rocky's Retreat -- Get your dog a massage. Rocky's Retreat is a fitness center for dogs, featuring hydrotherapy, massage, Reiki and even aromatherapy. Don't have time to get out to Winter Park? They'd do your dog's massage at your hotel. Call for pricing. 8) Pet-friendly events -- Plan your trip around a pet event! There is always a pet-friendly event going on somewhere in Central Florida each month, from big events like Barktoberfest and Paws in the Park in Orlando, to smaller events like Barks and Brews, Pookie's Rescuefest and the Doggy Derby. That's why I have an Orlando-area pet events calendar. Have an event you'd like to add to the calendar? Let me know! So, what would you like me to focus on at Global Pet Expo? Here's your chance to weigh-in and help me shape my coverage! Daylight saving time starts up again this weekend. Are you excited to lose an hour of sleep? Me neither. Is it me, or does it get tougher every year? You are dragging behind because you lose that hour. It never really occurred to me that the time shift might affect dogs. After all, they can't read time. However, they do have a biological clock that is very in tune. And just because our time changes, doesn't mean that these creatures of habit can change so easily. Now for Lulu, this may not be a problem. If anything, it may be easier on me because she is usually up an hour before I want to be, so we'll be matched up for a few months. I think she will adjust quite fine (six months from now, not so much). But not every dog is. Lots of humans need to be up an out of the house in the morning. You may find your dog actually trying to sleep in. So, what to do? Well the first thing to do is consider where you and your dog have a pretty set routine. Your pet may not want to get up early or is trying to figure out why they need to eat early. Now is a good time to sort of stagger out feedings and potty breaks, so that the dog gets used to a new feeding and potty time in time for DST on Sunday. Maybe on Saturday do things a little early, then the next day and the next day. It will let your pet gradually get used to the schedule change. Another thing -- your pet may get stressed.Watch for those telltale stress signs. Lulu, for instance, scratches more. Watch for your dog's telltale signs and help them out. Those could especially happen if you leave the house to run routine errands, like going to work or church. It might take a few days for pets to get used to the change, so go easy on them. Stupid daylight saving time is tough on everyone. Also -- don't forget to change your batteries in your smoke detector. Now's a great time to do it. Lulu's peanut butter jar. She likes Skippy. Saturday is National Peanut Butter Day. So of course, I had to share some with Lulu. This beagle loves her peanut butter. She can hear a jar open on the other side of the apartment. This is Lulu's Heartgard. I had to give it to her anyway, so I put on a dollop of peanut butter. Look at those eyes! She is excited! She took it down in one gulp though! No lip smacking! I don't know about you, but if you don't enjoy a dog eating peanut butter, you probably have no soul. So I pulled out a spoon and... well, here's how she took it. So I know what you'll ask -- is peanut butter even good for dogs? Actually peanut butter is: in small doses. It's great for giving your pet a pill, or mixing it with fruit and yogurt for a special treat. Or you can do what I do and just give her a spoonful. Just one spoonful. Or stuff some in a Kong and freeze it for a busy treat. Peanut butter is a good source of protein and vitamins too. Not just for your pet, but for you. Just try to stick to the natural peanut butters. If you can, go completely natural -- no salt or sugar. Just be aware: like people, dogs can get peanut allergies too. They can develop over time. You might see itching, redness and bald spots. Those are pretty telltale signs for most food allergies. Now, if you have some culinary skill, you could try your hand at making peanut butter treats! Head over to our buddies at Kol's Notes for all kinds of peanut butter treats.